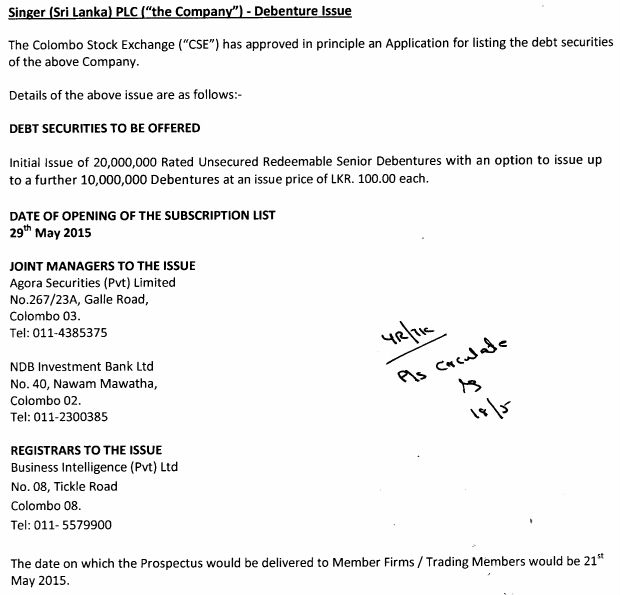 May 18, 2015 (LBO) - Sri Lanka, Singer PLC, is to issue 20,000,000 rated senior unsecured redeemable debentures at an issue price of 100 rupees per share, the company said in a filing to Colombo Stock Exchange. The filing also said that the Colombo Stock Exchange has approved in principal an application for listing the debt securities of the company. The company said it will issue up to a further 10,000,000 of the said debentures in the event of an oversubscription of the initial issue. The subscription list will open on 29th May 2015.